Sta. 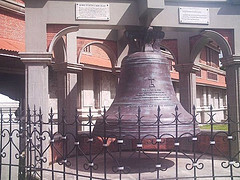 Monica Church is one of the most oldest church in the country it was built on 1774. 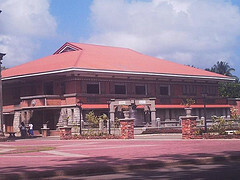 Which has been called "an excellent example " of the type of Filipino colonial Baroque style that has blended well with the Neo-Classical Influence. The majestic Baroque influences defined by the use of attached coupled piers in Corinthian style. 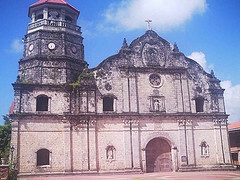 The grand structure of the church is made up of coral stone which is 70m long 25m wide and 18m high. the walls are 3m thick; the floor is covered with marble. Its structure is shaped in the form of latin cross with one large central altar and four lateral ones, the gilded retablos is gilded gorgeously sculptured of a fine hardwood. Various polychromed statues are highly decorated in an artistic quality. The architecture of the facade is articulated following the tenets of the Baroque movement. 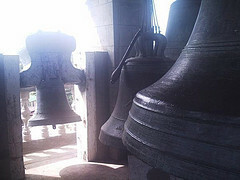 It was declared a National Landmark by the national Historical Institute of the Philippines on 1997. in the topmost tier of its five level belfry is the biggest and the mostly likely the heaviest Christian bell in Asia which was cast in 1878 using 70 sacks of coins. it is about 7ft. in height and 5ft. in diameter and weighs 10.4 tons . Christianity wad establish here when Fray Martin de Rada, OSA first preached the gospel to its native in 1566. Miguel Lopez de Legaspi set camp in Panay in 1569, making the town his temporary administrative capital after leaving Cebu for lack of food.